Before digging call for Underground locates: (800) 332-2344 or 811 at least 48 hours prior to digging. All Trenches must be a minimum of 36” deep. If a 36-inch depth cannot be achieved, contact Lane Electric’s Engineering Department at 541-484-1151. If trench is to be power only, the ditch needs be wide enough to accommodate the conduit, i.e. a 4-inch ditch-witch trench is sufficient. If the trench is dug through rough, rocky terrain, the conduit must be bedded with a minimum of 4 inches of sand. All conduits must be gray Schedule 40 electrical PVC. All primary conduit (7200V) must be 3 inches in diameter with 36-inch radius long sweeping elbows at any 90° bend. Secondary (120/240V) conduit for a 200 Amp. service must be 3 inches in diameter, with 36-inch radius long sweeping elbows at any 90° bend. Street or security lighting conduit must be 1.25 inches with 36-inch radius long sweeping elbows at any 90° bend. There will be no more than 270° of bend (3- 90° bends or 2- 90° & 2- 45°) in any one run of conduit, primary or secondary, between devices. All Primary conduits must be proved by mandrel. See Exhibit I for mandreling details. New mule-tape rated at 2500# must be left in all conduits, primary and/or secondary. Mule-tape must move freely in conduit and have sufficient length (10 feet or greater) beyond each end to accommodate installation of conductor. Mule-tape can be picked up at Lane Electric at no charge. After the Trench is dug and conduit installed, call Lane Electric 541-484-1151 to have an inspection scheduled by the Engineering and Operations Department. After the Trench and the conduit are inspected, the Trench may be back-filled. Conductor cannot be installed until trench is backfilled. Note: No electric lines, primary or secondary, may be placed under a concrete foundation or slab. 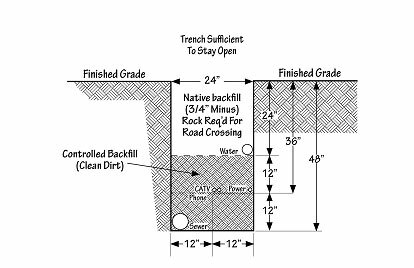 For more information, view the Typical Trench Detail Information (PDF).